Buffalo Urban Development Corporation is overseeing the transformation of the Northland Corridor in partnership with Empire State Development (ESD), the New York Power Authority (NYPA), and the City of Buffalo. Governor Cuomo has committed $44 million to the Northland Redevelopment Project, of which $6.7 million was granted to BUDC in September 2014 for property acquisition purposes. BUDC and its consultant, LiRo Engineers, formulated an overall redevelopment plan for the key properties acquired. Concurrent with preparation of this strategy, the City of Buffalo's Office of Strategic Planning is preparing a neighborhood revitalization plan for the larger surrounding neighborhood area. In June 2015, Mayor Byron W. Brown announced the City’s acquisition of the final Northland property. Subsequently, BUDC selected Mancuso Development as Property Manager to oversee the maintenance and marketing of properties. In February 2016, the City of Buffalo Planning Board completed its required environmental review for the entire redevelopment plan, which identifies the properties along the corridor that will be stabilized, renovated, remediated, redeveloped and/or, in some cases, undergo select demolition for the purpose of returning the area to productive use. The plan will assist in the revitalization of the surrounding neighborhood and provide employment opportunities for nearby residents by creating a new manufacturing and employment hub on Buffalo’s East Side. The project envisions a fully redeveloped Northland corridor, ultimately with a total of approximately 750,000 square feet of light industrial and commercial/general office space. In August 2017, razing of a substantial portion of the former Houdaille factory complex at 539 East Delavan Avenue was completed, which will now facilitate a NYS Department of Environmental Conservation-sponsor cleanup of this State Superfund site. Concurrently, BUDC is in schematic design and State Historic Preservation Office (SHPO) consultation for a planned rehabilitation/reuse of remaining components of this complex. Also, in late summer work began on a planned reconstruction of Northland Avenue between Grider Street and Fillmore Avenue, which will involve new utility consolidation, a deep mill and overlay of the street surface, new lighting, new sidewalks and pedestrian crossings, as well as the implementation of selective “green infrastructure” facilities intended to remove stormwater runoff from the City’s combined sewer system. The street project is anticipated to be completed in early summer of 2018. However, primary activity in the Corridor is now centered at the rehabilitation and adaptive reuse of 683 Northland Avenue, the former home of the Clearing Niagara factory. The first phase of construction at this complex (to be known as the “Northland Central” building) began in August 2017 and involves stabilization, cleanup, and rehabilitation of roughly 100,000 square feet of this 250,000 square feet complex as the future home of the Northland Workforce Training Center. Construction of this initial phase is scheduled to be completed in July 2018. Future phases will involve additional rehabilitation and fit out of space to support a move of Buffalo Manufacturing Works to the complex, anticipated by late 2019. Understanding the needs and concerns of the project’s neighbors remains a top priority. BUDC, in collaboration with the City of Buffalo Office of Strategic Planning and Sandra White from Mustard Seed World Consulting has developed a participatory planning process involving area stakeholders. This process has included several one-on-one and public meetings with area stakeholders. A stakeholder committee consisting of neighborhood groups, businesses, and organizations has been established to ensure community input and concerns are addressed throughout the entire process. As part of these efforts, a significant public process was conducted as part of the SHPO consultation effort conducted in accordance with Section 106 of the National Historic Preservation Act related to the planned selective razing of dilapidated structures that are eligible for listing on the National Register of Historic Places. This effort resulted in a Memorandum of Agreement signed by the project partners and SHPO to engage in several historic interpretation efforts to commemorate the importance of the Corridor to the development of Buffalo, the WNY region, and the nation. This will include exhibits to be installed at the Northland Workforce Training Center and at Buffalo Manufacturing Works. An accessible labor force, established road, rail, and utility infrastructure, and the potential for land assembly make the Northland Corridor an ideal location for business site selection. Contact Thomas Mancuso at Mancuso Business Development for real estate development opportunities within the Northland Corridor today. For additional information on the Northland Corridor Project, visit the BUDC website. 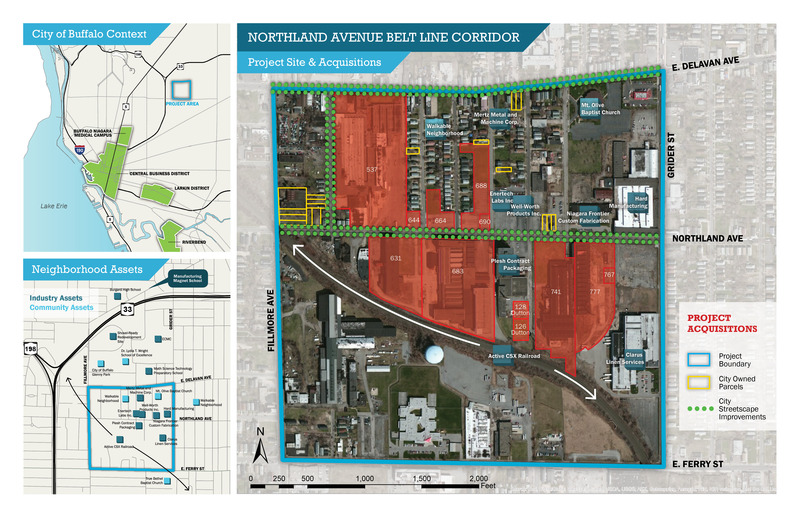 The Northland Corridor on Buffalo’s East Side is a 35-acre brownfield redevelopment project that will create an urban business park focusing upon advanced manufacturing, clean energy, innovation and workforce training. The project is aimed at providing economic employment opportunities for area residents, particularly those in some of the most underrepresented groups in the region's workforce. The Northland Corridor originally developed as a late 19th and early 20th century manufacturing center along the former New York Central "Belt Line" Railroad, and represented one of the most extensive industrial areas on Buffalo's East Side. The Northland Workforce Training Center, a signature component of Governor Andrew Cuomo’s Buffalo Billion initiative, will anchor the new business park; later additions will include Buffalo Manufacturing Works and a host of private manufacturing establishments. The project achieves Mayor Byron W. Brown’s goal of revitalizing the Delavan/Grider neighborhood and the larger East Side community. The Northland Corridor is located in a walkable neighborhood near the Erie County Medical Center, Mt. Olive Baptist Church, and several public schools, including Burgard High School, home of the new Advanced Manufacturing Program, a feeder institution for the Workforce Training Center. View the Northland Corridor Redevelopment Area Full Redevelopment Plan here. View the site plan for the Western New York Workforce Training Center here.